As I recently read in a Southern Living article, “We’ve all taken evening drives and noted the aesthetic pleasures of a well-lit house. Outdoor lighting accents the home and adds life to a nighttime landscape.” Outdoor lighting has become one of the more popular trends in landscape upgrades. Homeowners and designers alike have come to appreciate the affect that thoughtful landscape lighting can have on a home. Landscape lighting allows you to enjoy the view of your home and landscape throughout the evening. Lighting systems illuminate your property, giving you the ability to appreciate the seasonal interests of your home and plant material. This is true both in the winter and in the summer. In the winter when it gets dark early you can enjoy the view of your home and landscape through the evening, and few things are more striking than an up lit tree draped in snow. During the summer months landscape lighting allows you to entertain outside late into the evening. Thoughtful landscape lighting consists of much more than a row of path lights bordering your drive, making it look like a runway. We are not trying to create daylight at night and homeowners are often surprised at how few fixtures are required to transform their nighttime landscape. Good systems accentuate the architectural features of a home, the beauty of the landscape and promotes safety. 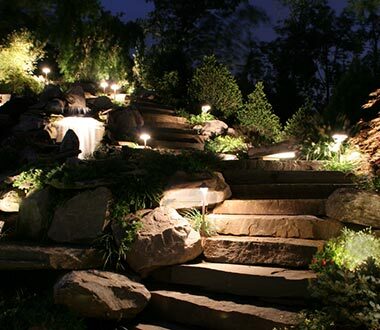 A well designed landscape lighting system consists of a mix of path lights, up lights and moon lights. Each light creates a particular effect and it is the mix of all three which produces the best outcome. The systems are not complex; however it is important to invest in a high quality product such as LumaStream or Cast Lighting. The systems available at home centers are very inexpensive, however it is an example of, you get what you pay for. Both LED and traditional (incandescent) systems run off of transformers which tie into your home’s electrical system. From that transformer we install a series of wires which run to each of the light fixtures. The advantage of the traditional (incandescent) system is that they are about 20% less expensive to install. The advantage of the LED systems is that they are exponentially less expensive to run and they do not require the routine replacement of bulbs. An LED bulb will run for approximately 21 years at 8 hours a day, all while drawing a fraction of the electricity used by traditional lights. Up until recently, traditional lighting systems had been the mainstay of outdoor lighting due to the warm light color they produce, however with the advancements in LED technology, high quality LED fixtures produce the same warm colors found in traditional lighting systems. 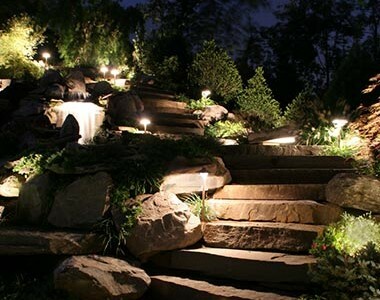 If you would like to have landscape lighting installed and you live in Northern Virginia, then give us a call or request a consultation and we’d be happy to meet with you and discuss your landscape lighting needs. You can also check our landscape lighting service page. ← Why Does Everyone in McLean, Virginia Love Knockout Roses?